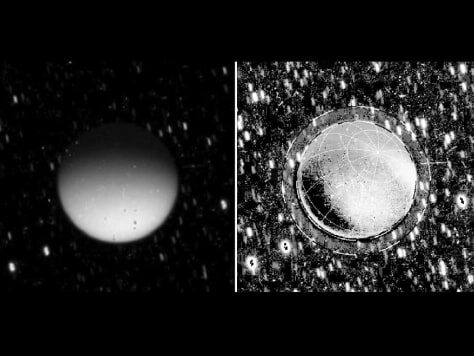 These images from NASA's Cassini spacecraft show Saturn's moon Titan glowing in the dark while in the planet's shadow. At left is a calibrated but unprocessed shot from Cassini's imaging camera. The image on the right was processed to exclude reflected light off Saturn. Some light appears to be emanating from high in Titan's atmosphere (noted by the outer dashed line at about 625 miles in altitude). But most of it is diffusing up from about 190 miles above Titan's surface.